In the latter part of the twentieth century, the topic of generalizations of convexfunctions has attracted a sizable number of researchers,both in ma- ematics and in professional disciplines such as economics/management and engineering. In 1994 during the 15th International Symposium on Mathem- ical Programming in Ann Arbor, Michigan, I called together some colleagues to start an a?liation of researchers working in generalized convexity. The international Working Group of Generalized Convexity (WGGC) was born. Its website at www.genconv.org has been maintained by Riccardo Cambini, University of Pisa. 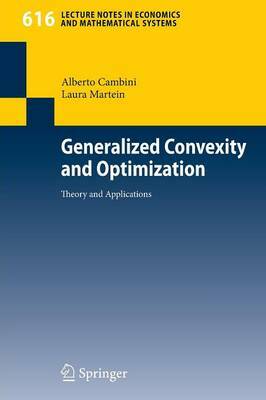 Riccardo's father, Alberto Cambini, and Alberto's long-term colleague Laura Martein in the Faculty of Economics, University of Pisa, are the - authors of this volume. My own contact with generalized convexity in Italy datesbacktomy?rstvisittotheirdepartmentin1980,atatimewhenthe?rst international conference on generalized convexity was in preparation. Thirty years later it is now referred to as GC1, an NATO Summer School in V- couver, Canada. Currently WGGC is preparing GC9 which is to take place in Kaohsiung, Taiwan. As founding chair and also current chair of WGGC, I am delighted to see the continued interest in generalized convexity of functions, augmented by the topic of generalized monotonicity of maps. Eight international conferences have taken place in this research area, in North America (2), Europe (5) and Asia (1). We thought it was now time to return to Asia since our membership has shifted towards Asia. AsanappliedmathematicianIhavetaughtmostlyinmanagementschools.